Wash the Bengal gram and soak it. Wash and peel the pumpkin and cut it into medium sized pieces. Take a microwave safe bowl and add the pumpkin pieces and 25ml water. Place this bowl in a microwave oven and cover it partially. Cook the pumpkin pieces on high power for 5 minutes. Wash peel and remove the seeds of the bottle gourd and cut it into medium sized pieces. Take a microwave safe bowl and add the bottle gourd pieces and 50ml water. Place this bowl in a microwave oven and cover it partially. Cook the bottle gourd pieces on high power for 5 minutes. Stir once with a spoon and cook on 30% power for 7 minutes. Allow 5 minutes standing time before removing this bowl from the oven. Take a microwave safe bowl and add the tamarind and 25ml water. Place this bowl in a microwave oven and cook on high power for 1 minute or till it boils. In a microwave safe bowl and add the seeds and peels of the vegetables and add 25ml water. Place this bowl in a microwave oven and cover it partially. Cook them on high power for 5 minutes. When cooked, cool them and make a fine paste in a mixer grinder. Cut coconut into small pieces. Similarly break red chilies into small pieces. When the Bengal gram is soaked remove water from it and keep it aside for grinding. Do not throw away this water. Use the soaked water for grinding the masala. Take a mixie jar and add coriander seeds, cumin seeds, black pepper, red chili pieces, coconut pieces, soaked bengal gram and cooked tamarind. Grind this to a smooth paste adding the soaked bengal gram water. The paste should be finely ground. Heat a pan and add the cooked bottle gourd, cooked pumpkin, paste of peels, masala paste, grated jaggery and some water. Mix well and add turmeric powder and salt. Mix well and cook covered for 5 minutes. Remove the lid after 5 minutes and let it boil. Heat a pan and add oil to it. When the oil is hot add the fenugreek seeds, mustard seeds and cumin seeds. When the seeds splutter add the asafoetida and curry leaves. Add this seasoning to the boiling Pulusu and mix well. Check the consistency. If the Pulusu is too thick add some water. Transfer the Pulusu to a serving bowl and garnish with chopped coriander. Do not throw away the peels of the vegetables. As the vitamins of the vegetables lies just beneath the skins, try to eat the vegetable along with the skins. If it is necessary to peel the skins use them innovatively in your dishes to retain the vitamins. At times many do not like the seeds of the bottle gourd while eating. So cook them, grind and add to the dish- this will thicken the consistency of the dish. 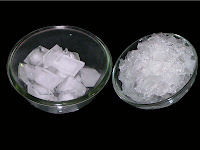 If the consistency of the dish is too thick dilute it with water—but remember to add salt also to balance the taste. This Pulusu thickens on cooling, so add water and let it be a bit thin. Along with pumpkin and bottle gourd one can even add lady’s fingers, brinjals, potatoes, radish etc. to prepare this Pulusu. Yam and Elephant Foot (KANDA) are good for health. These vegetables bring relief for those suffering from menstrual disorders. In this recipe replace bengal gram with cooked yam or elephant foot and prepare the Pulusu. It is tasty, healthy and also helps for those suffering. In olden days people were not using tomatoes and onions to prepare sambar like dishes. They used to prepare this Pulusu with one vegetable or using a combination of vegetables without using onions or tomatoes. Serve this Pulusu with hot rice and enjoy the great taste which our ancestors have enjoyed. Dear Gayatrigaru, I introduced myself earlier, as someone who never lived in India, but hails from an Andhra vegetarian family. Your site is very helpful. I have eaten something called mukkala pulusu which is very different from the one you have posted. It is just made with vegetables(drumstick, pumpkin, sweet potato, okra) without coconut or legumes. It also has a sweet and sour taste and has the consistency of a thin vegetable soup. I am confused on what the name might be and how to make it. Would you be able to help me? Also, I would like to have more recipes for ivy gourds (dondakaya). This is a vegetable that is available globally only in the last 10 years, so I am not familiar with different recipes, but my children love it. I have prepared it as you did with lemon juice. Are there other ways to prepare this vegetable? 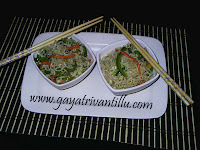 The recipe which you have indicated is known as "Gatti Pulusu" at my place. Its a tasty traditional dish, which is taken mostly as a side dish along with "Mudda Pappu". My grand mother used to prepare it!!! నేను ఈ మద్యనే మీ ఈ గొప్ప WebSite ను కొనుగున్నాను. మీ Youtube Videos నిజంగా చాల చక్కగా టూకీగా ఉంటాయి. నేను మీ అబ్బాయి లాగానే ఒక బ్యాచిలర్ని US లో ఉంటూ మన తెలుగు వంటలు తినాలని అనిపించినప్పుడు మీ వంటిల్లు చూసి ఎలా చేయాలో తెలుసుకుంటున్న. మా లాంటి ఏంతో మంది cook Surfers కి మీ instructions మంచి వంట తినే బాగ్యం కల్పిస్తున్నారు . మీ Sharing దృక్పధానికి జోహార్లు. Thanks for ur gud recipies. I have tried few. They came out very well. 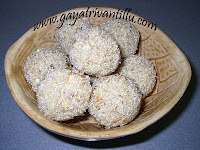 I want you ask how to make Garjalu(i dont know what it is called in andhra..may be kajjikayalu). Could you please post the recipie. Me website chala bavundi, specially patta. I often open your website to listen to that song. it cheers me up when i am sad. We live in US, i see your video and pics, as they remind me of my mom and her kitchen. Chala padhathiga vuntundi me kitchen, just like my mom's.